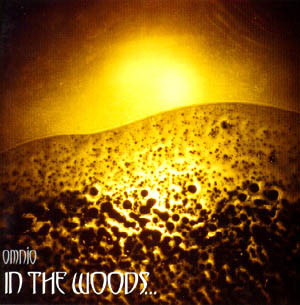 In The Woods... have defied all expectations via their latest recording, Omnio. Through the use of keyboards, female vocals, and violins combined with excellent quiet/heavy dynamics and long, immersive songs, In The Woods... has forged a masterpiece. They have shed all the black metal trappings of their previous effort, Heart Of Ages, and really let forth a metallic supernova through this album. In The Woods...'s strength lies in their diversified approach. The varied instrumentation on the album keeps the long songs from becoming tedious, and really allows the band's compositional talents to shine. They have by no means "sold out" by dumping the 'black' vocal style, in fact, the songs are as about as uncommercial as they come due, to their length and possibly esoteric nature. The female/ 'clean' male vocal switches serve as effective counterpoints and are actually one the best things about the album. The problems with this album are virtually non-existent, the only complaint that one might come up with if one looked hard enough is that the listener might find his/her attention wandering at various times during the album. In fact, I often find myself drifting off and falling asleep while listening to it. However, this is a small complaint and is due more to the sometimes dreamy and spaced-out nature of the record than any kind of boredom. "Weeping Willow" is probably my favorite track and is really a microcosm of everything the album offers. I'm afraid that this album may be tragically overlooked by the metal buying public, especially here in America where availability is non-existent. Even albums released by 'bigger' metal labels like Century Media and Relapse can be hard to find here, much more so with smaller labels like Misanthropy, who carry this album. However, I urge any metal fan, especially those who enjoyed The Gathering's Nighttime Birds or Tiamat's Wildhoney, to actively seek this album out through mail-order, import stores or any other necessary means.